It's been a minute but Eternia is back again with Episode 14 of "Road to Release". Check it out! 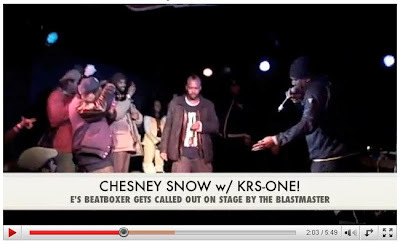 "In Episode #14, Eternia opens for KRS-One w/ her band @ Southpaw in Brooklyn. E debuts a new song off Eternia & MoSS's "AT LAST" album, & beatboxer Chesney Snow is called out to perform on stage with The Blastmaster KRS-One himself, who kicks an EXCLUSIVE FREESTYLE. Also features still's from photographer Kenny Rodriguez's coverage of the night. E's "AT LAST (We Got a Record Deal) JAM!" 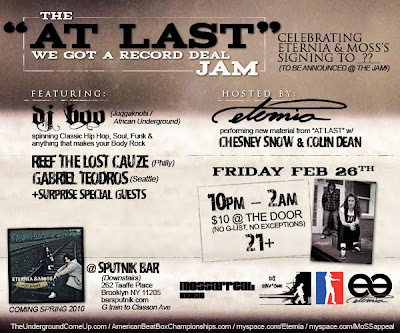 on Fri. Feb 26th at Sputnik in BK!"